Both men and women are able to experience anger in its most natural and healthy form; ie. the emotional energy that pushes through or past something that is frustrating us. Unfortunately many of us also experience anger that comes from overly protecting ourselves from our various hurts. This type of anger usually becomes accumulated, distorted, knotted up inside us or hurled at those around us. 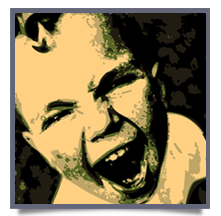 In this second case – anger that is not being expressed at all or being expressed inappropriately – therapy can be an enormous help in learning calming techniques, understanding triggers and getting to know the real causes of anger, whether it be pain, frustration, humiliation, isolation, manipulation, confusion, or habit – whether it is from years ago or right now! Many people in individual psychotherapy and in the groups I ran – “Understanding Anger” – have benefited from being able to voice their intense feelings, think through their difficult situations with someone else, not having to sort it all out on their own. You don’t have to continue putting yourself and others through it. If you are thinking that it might be time to resolve this issue, call for a confidential assessment session.